Central Westmoreland Council of Government's goal is to help Pennsylvania municipalities and organizations "Do More With Less." More than ever, you need to do just that - Get more services accomplished with less money in your budget. Our members and associate members participate in cooperative purchasing - saving municipalities and organizations money because the COG negotiates volume pricing. Purchasing by volume and in groups allows communities to offer a wider variety of services to their residents than would otherwise be possible. Who is eligible to join? 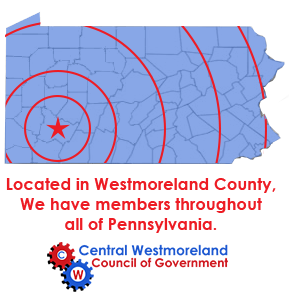 Any Pennsylvania organization that receives government money is eligible to join Central Westmoreland COG. In addition to any PA municipality, organizations like school boards, fire departments, police departments, and more can take advantage of our cooperative pricing programs for vehicles and more. Westmoreland COG is entire membership funded. The COG does not receive tax or grant monies. The savings we negotiate go right back to the member municipalities.